INTRODUCTION: Hydatid disease, caused by the tape worm Echinococcus, results in liver and pulmonary cystic lesions. Although frequently asymptomatic, chronic inflammation from hydatidois can result in portal hypertension and ascites. 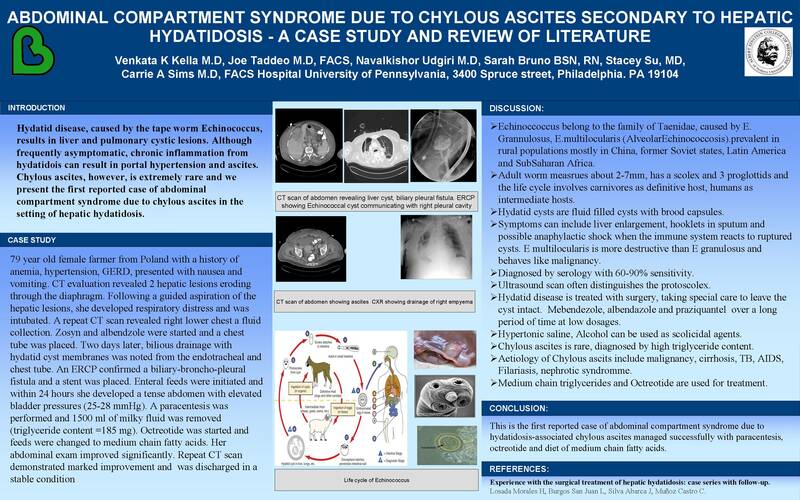 Chylous ascites, however, is extremely rare and we present the first reported case of abdominal compartment syndrome due to chylous ascites in the setting of hepatic hydatidosis. chain fatty acids. Her abdominal exam improved significantly. Repeat CT scan demonstrated marked improvement. She was discharged in a stable condition. CONCLUSION: We present the first reported case of abdominal compartment syndrome due to hydatidosis-associated chylous ascites managed successfully with paracentesis, octreotide and diet of medium chain fatty acids.